Gifts from the Pirates: "That's my secret, Cap: I'm always angry." A few days ago we had to quickly rush out so get Seth something sporty for school as he had a sports/olympics theme none school uniform day and we had completely forgotten about it until 17:00 the night before. Had it been a Super hero themed none school uniform day i can guarantee i would have been a lot more organised and he prob would have ended up that school morning with a selection of outfits to choose from just incase. Oh well ill just have to wait patiently for that Super hero themed birthday party invite that may appear in his book bag anytime soon. Anyway after popping into the sports shop Mrs M decided she wanted a look around Asda living (oh joy i thought at the time). I was very happy that we went in there though, While we were perusing the isles we spotted this Incredible Hulk pyjama set. Since buying them Opeie hasn't wanted to take them off and keeps sticking his arms out and doing a very serious faced Hulk Smash (I'm so proud). 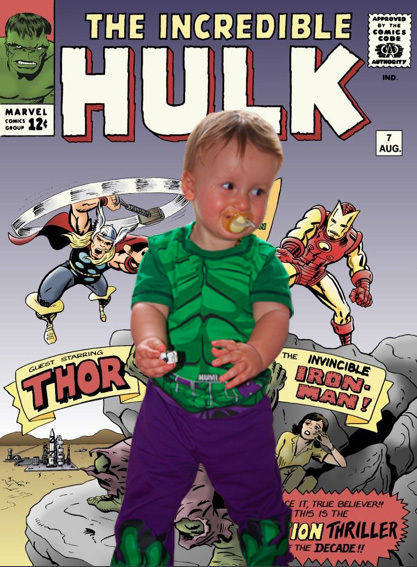 I tried every thing to get Opeie to stand in front of the huge Hulk canvas in Seth's room but Kid's being Kid's he didn't want to stand still. Thank fully Mrs M has magic fingers when it comes to Photoshop so she made me a Smashing (god that was terrible) comic book cover. Those Pj's are amaze!!!! MAZE!